The firmware of your Linksys Wireless-AC and Wireless-N Access Points can be upgraded using the HTTP / HTTPS, or TFTP methods. Go to the Linksys Support Site for the latest firmware release of your access point, then download and save it to your computer to perform the upgrade. IMPORTANT: During the firmware upgrade, do NOT disconnect the access point from the computer or power OFF the device. It will reboot automatically when the firmware upgrade is complete. 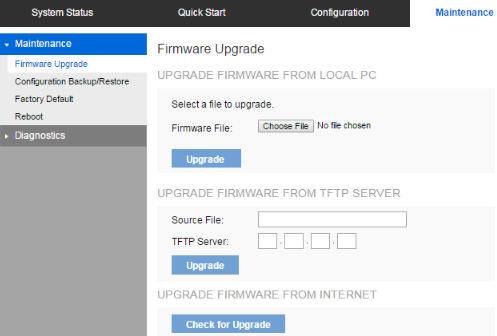 Upgrading the firmware occurs in the device's web-based setup page. To gain access to this page, click here for the step-by-step instructions. Once the setup page is up, click on Maintenance > Firmware Upgrade then choose one among the three options to proceed with the upgrade. Click the Choose File button and navigate to the location of the firmware file that you downloaded earlier. Select the firmware file. Its name will appear in the Upgrade File field. Click OK to start the firmware upgrade. Enter the path of the firmware file on the Source File field. Then enter the IPv4 address of the server in the TFTP Server field. NOTE: The firmware file supplied must be an .img file type. Click the Upgrade button to start the upgrade process. ​NOTE: This option is only available in supported access points. Click the Check for Upgrade button to verify if there is a new firmware available. Click OK on the pop-up dialogue box to start the firmware download and upgrade if a new version is available. You should now have upgraded the firmware of your Linksys Wireless-AC or Wireless-N Access Point.